Since the repair of my Phillips 42 inch plasma TV went so well, I decided to research if there’s any Kenwood VR-407 repair for the remote sensor. It was great for years, then slowly, sometimes wouldn’t receive signal. Then after a while it worked again. I had tried different remotes so I knew the remote wasn’t the issue. The cause of the issue is poor soldering on the 3 optical sensor leads, which appears to be a common issue on Kenwood receivers. The 1st two pictures are the board to the front panel, I removed the receiver’s cover (about 6-10 screws), then partially removed the front board (several yellow screws, some cables had to be unplugged – I wasn’t able to completely remove the board). 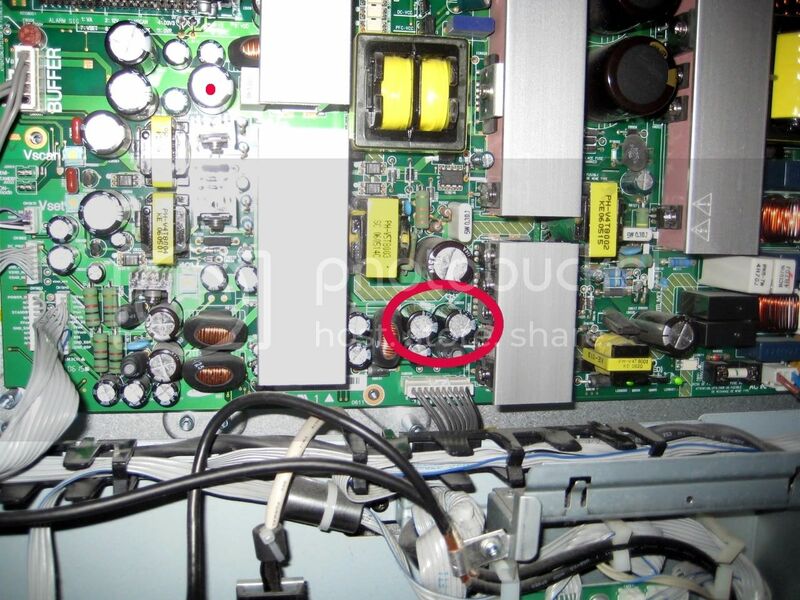 We managed to avoid a $300+ repair recently by fixing the capacitors in our Philips 42″ plasma TV ourselves. The unit is only about 3-4 years old and we were really disappointed it started having problems so quickly. Sometimes it wouldn’t turn on, and would simply flash the red LED seven (7) times slowly. I decided to do some research on the internet for possible home solutions for this plasma TV repair. There’s actually a lot of information online about this problem, and how to do the fix. Both my bad capacitors were 3300 mF / 10V / 105 degree centigrade rated. They both were slightly bulged at the tops, with a small amount of black material coming through the top. Every other capacitor on the board had a shiny, flat top.